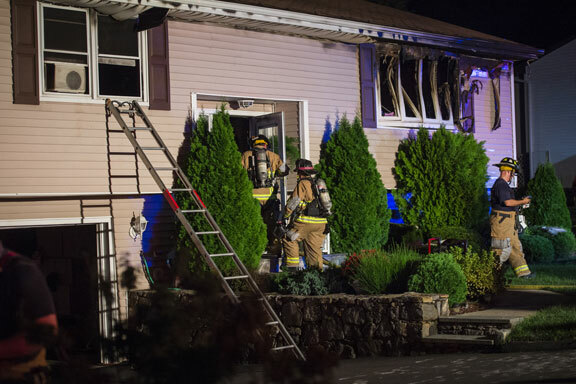 NAUGATUCK — A fire Friday night left a home on Inwood Drive uninhabitable. Firefighters responded to 130 Inwood Drive shortly after 8 p.m. When firefighters arrived, they found a blaze on the right side of the upper lever of the raised ranch home. The stifling scent of smoke traveled as far as three blocks away. Firefighters had the fire under control by about 11:15 p.m., Provisional Fire Marshal Robert Weaver said. The couple who lived in the home were not injured, he said. No firefighters suffered any injuries. The fire did significant damage to the house. Weaver said the blaze started under an enclosed deck attached to the back of the house. The deck was completely destroyed. The fire spread to the living room and kitchen, Weaver said. There was extensive smoke and heat damage to the remainder of the house, he said. The cause of the fire remains under investigation. Weaver said officials are looking at the possibility that the fire started from filtration equipment and other equipment for an in-ground pool that was located under the deck. Surrounding fire departments, including Beacon Hose Company No. 1 and the Volunteer Fire Department of Prospect, responded to the scene to provide mutual aid.